On Sept. 2, McGill’s Faculty of Dentistry inaugurates its brand new facility located at 2001 McGill College Ave., across from the Roddick Gates. For the first time in the Faculty’s history, pre-clinical and clinical training, community-based research and administrative operations will be brought together in one location. 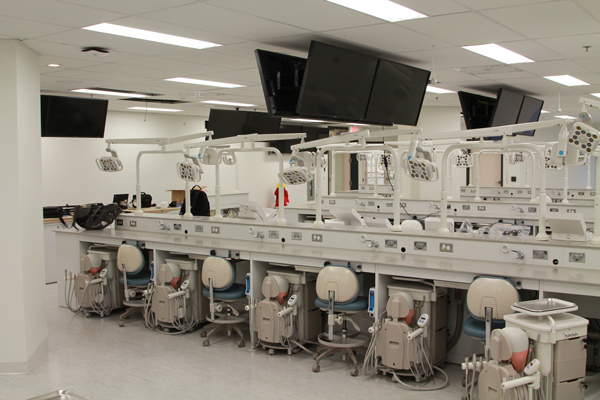 It’s a Dentistry dream that is over a decade in the making and a long way from the Faculty’s near closure in 1992. This month, McGill’s Faculty of Dentistry inaugurates its brand new facility located at 2001 McGill College Ave., across from the Roddick Gates. For the first time in the Faculty’s history, pre-clinical and clinical training, community-based research and administrative operations will be brought together in one location. This will profoundly affect the synergy among units and enable the Faculty to serve the Montreal community more efficiently. “The challenge is to anticipate the needs of our students and patients for the next 20 years. I believe that in creating this new facility, the Faculty is meeting this challenge and we will have a greater impact on the community than ever before,” says Jeffrey Myers, Associate Dean Clinical Affairs. Amidst the latest modern clinical facilities and active learning spaces, students and researchers will have the opportunity to collaborate even more closely as the new facility becomes a true hub for its award-winning community outreach initiatives. These include four satellite clinics as well as collaborations with more than 24 community groups and agencies throughout the Montreal area. But beyond offering affordable and free oral health care to some of Montreal’s most vulnerable individuals, the Faculty’s outreach work gives dental students crucial training and excellent role-modeling experience. The $18.3-million project, for which the Faculty is still fundraising, will allow for more comprehensive and advanced dental care, but it also opens up a world of new possibilities in terms of teaching and research. “Now, we not only have fantastic students, staff and faculty, but also a fantastic new facility…Imagine what we can do! We simply have to use our imagination”, explains Paul Allison, Dean of the Faculty. • McGill Dentistry features the only mobile outreach dentistry clinic in Quebec, which serves as a model for a number of other dental schools nation-wide, and uses mobile dental equipment to go directly into community centres and provide free, high quality dental care to families in poverty, the elderly, recent immigrants, refugees, and people with disabilities. • With only five per cent of Canadian dentistry professors, McGill carries out nearly one-third of all funded research in dental facilities and trains more dental research graduate students than any other Canadian university. • To date, alumni and friends of the Faculty have helped secure $6.7 million in donations for the $18.3-million project. • The Faculty’s basic researchers and their biomedical labs will remain nearby on campus at the Strathcona Anatomy Building. Learn more about the Dentistry’s new facility through the Faculty’s official campaign video below.